We picked up Hagop and Ashley in Livingstone. They had flown in from Johannesburg to finish the final portion of our trip with us. 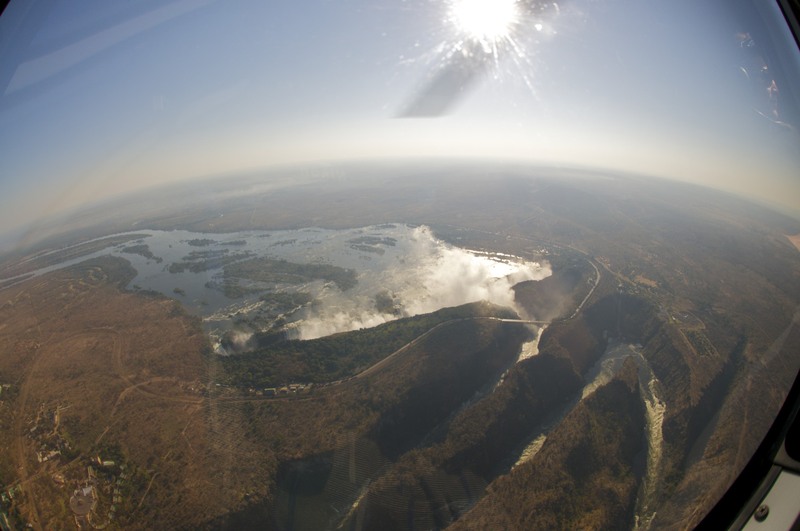 Victoria Falls lies about 5km from Livingstone. After enjoying some margaritas and tacos at a local watering hole, and yes we are still in Africa! We caught our first glimpse of the falls. It’s amazing just how much spray the falls produce. This was truly a highlight of the whole trip for me. I have wanted to visit Vic Falls since I was first aware of it’s existence. Words simply do not explain just how amazing the falls are. Even with all the commercialism surrounding them they are still nature’s wonder and man can’t take credit for them. After walking down to take a closer look at the falls there was not a dry stitch on our bodies. The spray from the falls makes it seem like you are in the middle of a rain storm. Before walking down the park tried to sell us a poncho to keep dry. The funny thing was that everyone in ponchos were completely soaked from the bottom up. There was just no way to avoid the powerful falls. This photograph was taken right above the falls. Seeing and being soaked by the falls were just the beginning of our adventures. 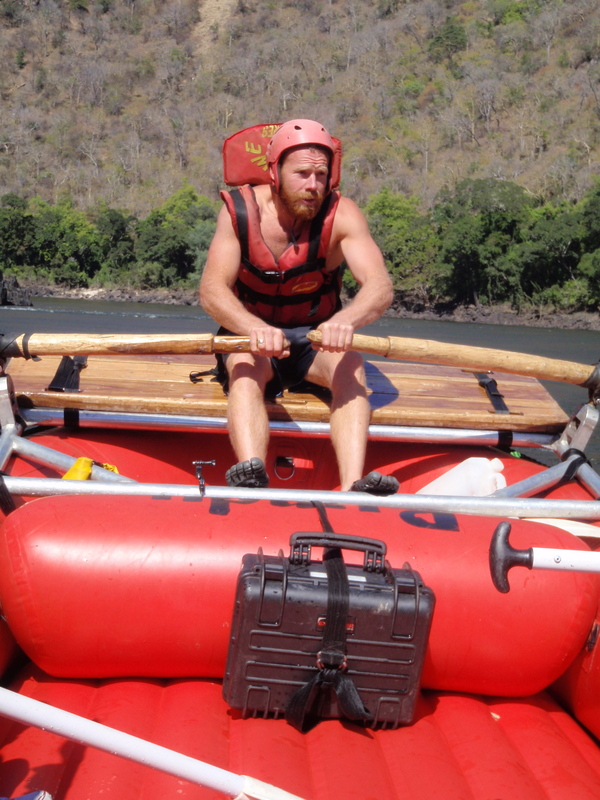 We only had two days so we decided on a rafting trip and a helicopter ride. The rafting was by far my coolest rafting experience to date. 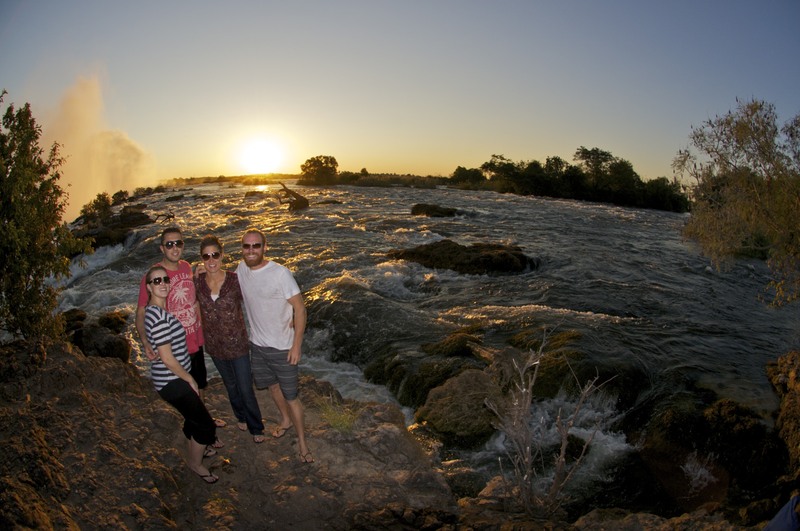 We were picked up at our camp in the morning and taken off for a day of fun on the Zambezi River. Our guides bundled up for the chilly morning ride. 15 minute hike down to the river. They did not tell us about this when we signed up. Final preparations…We thought we had it tough hiking down, never mind the workers who carried the rafts down and then pumped them up for us. A stop off on the river for a little cliff jumping. Merv showed up my basic jump with a back flip from a higher ledge. At one point while we were surrounded by waves and cresting the one in front of us we were inches away from being flipped. It was as if we were in the ocean, not a river. The experience was intense but such an awesome adrenaline rush. Our guide expertly navigated us into safer waters. One side of the river was Zambia and the other Zimbabwe. We took a short break in Zimbabwe. The kayaker was our insurance policy. He was there to help if we fell out or the boat tipped over. Merv giving the ores a go in calmer waters. We finished the trip with lunch and cold beers on the side of the river. It made for the perfect ending to an already awesome experience. The next day we visited the falls from the air. After Victoria Falls it was time to start heading south again back to Pretoria, South Africa. We had an incredible six weeks on the road and we were able gather lots of information for trip planning. Our route back took us two days. We spent one night near Chobe National Park and one in Francistown, Botswana. We savored every last moment of the trip even on the road. This was a stop for sundowners on the way to Francistown. We arrived back in Pretoria late in the evening on June 23rd. I have to say it did not feel right to be back. It seemed like we should still be on the road. I guess that is the reality of a memorable trip coming to a close. Merv is still in South Africa working on the website and pursuing his freelance photography. I’m back in the US working in the Hamptons for the summer. Stay tuned for trip itineraries on the website. We would love to be up and running by November/December. Thanks for the opportunity to travel along with you on your amazing journey. I continued to feel like I was there as I read recipes and came to the conclusion of the journey. Like a good read, I also, did not want the journey to end. Looking forward to future adventures.